During Heritage Trail Days on Sunday, September 26th. Terre Haute Township dedicated the old Baptist Church bell, which has a new home at the Terre Haute Fire Station. 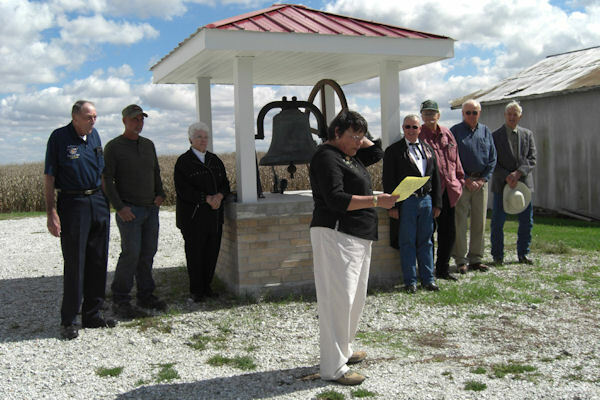 Dianne Lozar, Terre Haute Township Supervisor welcomed the group who came for the dedication. She then introduced Gary Butler, Trustee; Ralph Torrance, Trustee; Tom Edmonds, Trustee; Martha Reed, Cemetery Caretaker; Bob Reed, Fire Chief; Richard Apt, Trustee; and Jeff Jarvis of Double J Construction of Dallas City, who put up the bell. Lozar said the Baptist Church was built in 1866 and dedicated in 1867. The church was torn down in 2009, at which time plans were put in to motion as to what to do with the bell. The money for the project came from taxes and the fire department gave a generous donation. A capsule has been placed inside containing, among other things, a picture of the original Baptist Church, an American flag, and local papers. Lozar said, "Terre Haute Township, this is your bell. Be proud of it and protect the bell. We are a community of God." In closing Ralph Torrance was asked to ring the bell 3 times and the bell rang out loud and clear on a beautiful sunny day for all of Terre Haute to hear.